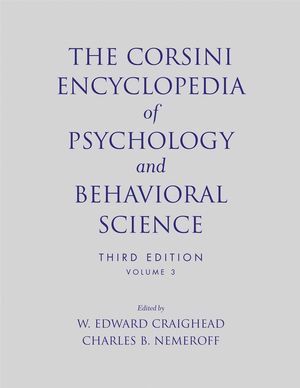 The Corsini Encyclopedia of Psychology and Behavioral Science, Volume 3 provides researchers, practicing psychologists, teachers, and students with an exhaustive reference for the field. 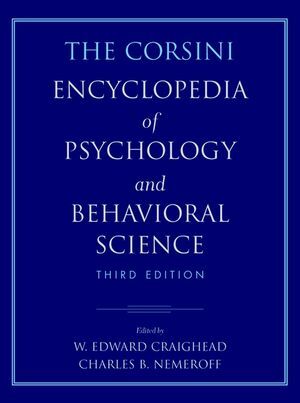 Covering psychological and behavioral conditions, treatments, testing, diagnoses, and much more, this invaluable resource provides information on over 1,200 topics across four volumes. This Third Edition features new coverage of biomedical research and neuroscience findings to reflect the growing impact of evidence-based treatment, and includes profiles of influential psychologists and psychological organizations from around the world. W. EDWARD CRAIGHEAD, PhD, J. Rex Fuqua Professor at the Emory University Medical School, is best known for his leadership in professional organizations and as a clinical investigator in the realm of depressive disorders.